There are many things that constitute snowboarding equipment, from the snowboard itself, to bindings, boots, gloves, toques/helmets, and more. An absolutely essential article is a good pair of snowboarding goggles, but how can you know which one is right for you? The following tips will show you how to equip yourself with the best for this popular winter sport. First and foremost, you want your snowboarding goggles to be comfortable because you will be wearing them the entire time you're on the ski hill (or half-pipe, as the case may be). Ensure that there is enough foam padding on the goggles where it meets your face, with no sharp edges exposed which could cut into you. Make sure that the goggles fit well and that they are neither too big nor too small. Without proper ventilation, not only will your eyes (and face) get quite uncomfortable from the stuffiness, but your goggles will likely fog up. This can be quite the dangerous proposition, especially since you'll be flying down the mountain at breakneck speed. There should be vents both on the top and bottom of the goggles, and ideally the lenses themselves are anti-fog. Your own body heat will cause most of the fogging, so while in the store, try breathing into the inside of the goggles and see how well the lenses hold up. The actual color of the lenses themselves is of personal preference, with most snowboard goggle models coming in a variety of hues. I tend to avoid the yellow lenses myself because it makes the scene appear too bright for my tastes, while at the same time, you should avoid lenses that are too dark as well so that you are not going down the ski hill completely blind. Most people opt for an orange or pinkish hue. Despite the fact that snowboarding is primarily a winter sport, the sun still plays a significant role because its bright rays reflect off of the white snow and into your eyes. In this way, your ski goggles will double as a pair of sunglasses. Most snowboarding goggles come with UV protection and some form of anti-glare, but double check with the sales associate before making your purchase. Your snowboarding goggles are also an article of clothing, so to speak, and snowboarding is an incredibly fashionable sport. While this may not be a concern to some people, it will dictate the choices made by many more. Consider the color that your touque, snowboard jacket, snowboard pants, board, bindings, and the like will be and try to find a pair of goggles that match or complement your chosen color scheme. 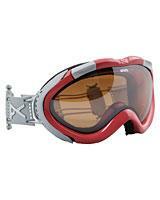 As with everything else, the prices for a decent pair of snowboarding goggles vary widely. At the low end, you can pick up bargain basement pairs for less than $30 (try to avoid these) and the sky is the limit when it comes to professional-level goggles. As a rule of thumb, most sets for the average casual snowboarder will run you between $80-$120. Shop around for the best deal. Hitting up the outlet malls and eBay for last year's model is usually a good idea, because as a hobby, you don't need the most cutting edge snowboarding goggle technology.